We all enjoy spending time with our dogs – in fact, it’s probably one of our most cherished activities. It’s not surprising, then, that we tend to take our dogs with us wherever we can. However, there are some places we can’t take our dog, even on a leash, and there are certain situations where we just need to get something done without our dog pulling on the leash, sniffing around and trying to have their way. That’s why dog carrier purses are here for! We’ve all been in that situation when we’re walking our pup and a friend calls us to come over to the mall, or a café, restaurant – you name it. So, instead of having to go back home, leave your furry friend there and then go out to enjoy the rest of the day, a dog carrier purse can seriously make your life easier. With a well-chosen dog tote, you don’t have to plan your day around dog walking. Instead, it gives you the luxury to be flexible with your time and planning and easily pack your pup in the tote if they’re tired, need sleep or rest, or can’t run around the next place you’re going to. 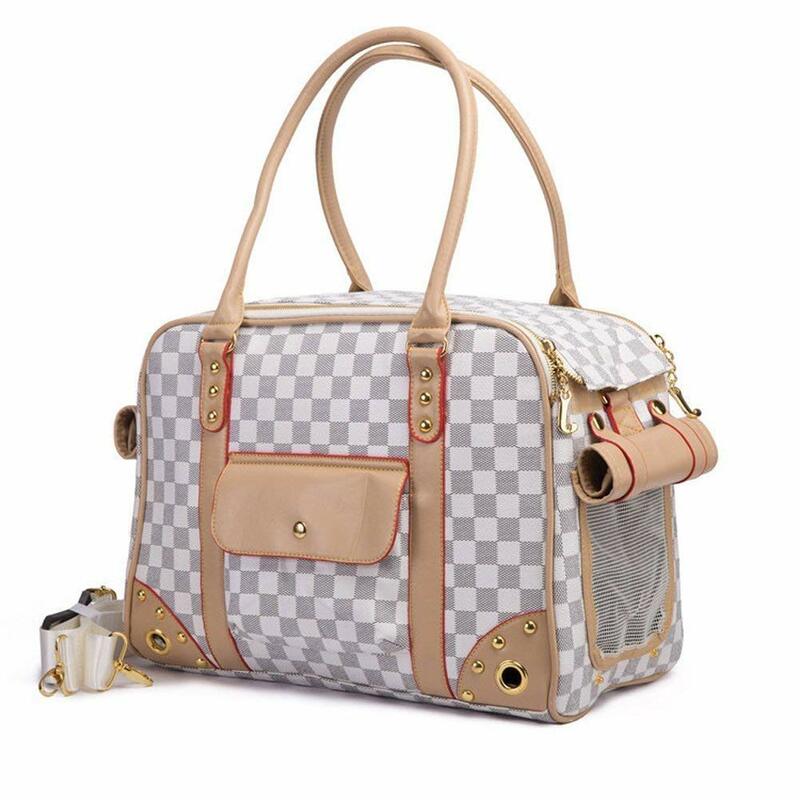 As an added bonus, there are dozens of beautiful and practical dog carriers that look like purses, that can blend with your style and outfit seamlessly. Gone are the days of carrying your dog in one hand and holding your purse in the other; now, there are purses that can do both. Better yet, these totes are so well-designed that no one will even notice that you’re carrying your dog around, which is precisely the point of getting one. In this article, we’ll introduce you to some of the most attractive, high-quality dog totes on the market and help you pick the best dog purse that both you and your puppy will enjoy. Keep on reading to find out which aspects of these purses should you pay special attention to, how to choose the right one and all the ways you can customize your puppy purse carrier! 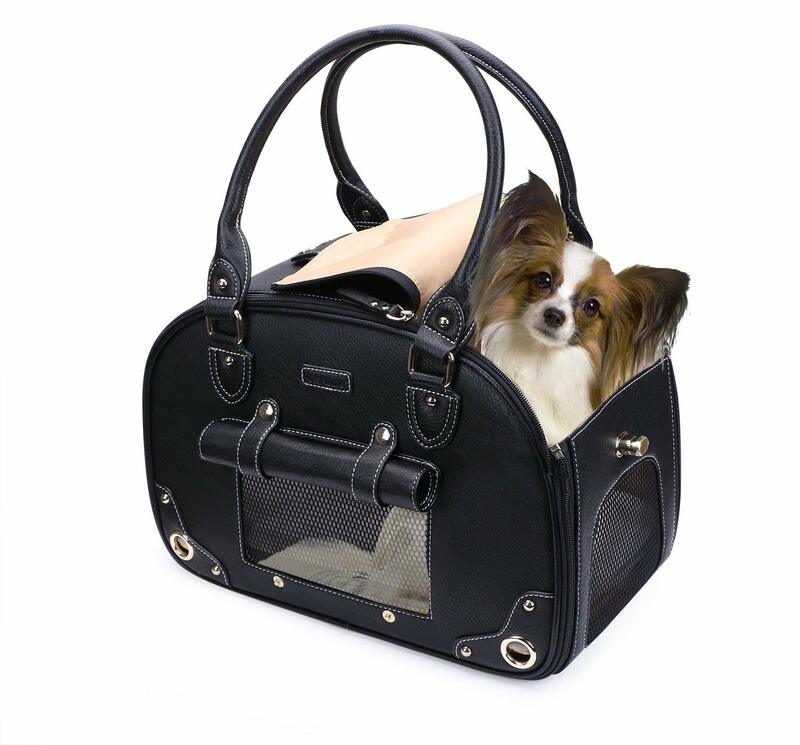 The PetsHome Dog Carrier Purse is a clear winner in our books, not just because of its quality, but because it looks like it’s haute couture. The clean, yet rounded lines make for an extremely elegant look, and the quality PU leather exterior gives it that extra ‘oomph’ while being really easy to clean. Due to the stylish white stitches, this PU leather dog purse looks rough around the edges, which is great because that way, you can sport this sturdy beauty with jeans and a hoodie, as well as a classier, formal look. Both the outside and the inside are made out of a waterproof material that will keep your dog dry and clean, no matter the weather conditions. There are also two soft-padded memory foam bottom pads for the ultimate comfort of your pup, and yes, if you’ve been wondering – of course, there’s a fixed leash inside that will keep your pet from running away. 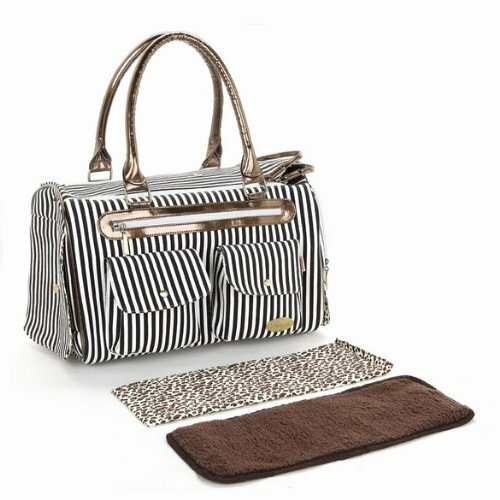 The PetsHome purse features a full zip opening on top, with three rows of fastenings and consequently, three opening sizes. There are two mesh panels on the sides that provide great ventilation, even if the top is completely closed. There is also a ‘curtain’ on the front window, which allows you to provide more privacy to your pet when needed. The product weighs around 2.5 pounds and comes in two sizes: small (14.96 x 7.87 x 10.24in) and medium (17.33×9.25×11.81in) and comes in five stylish colors: black, brown, beige, royal blue and wine red. It’s foldable and easy to store so that you won’t have to have a dedicated space for it in the house. As far as the practicality goes, there is a back pocket that can store your credit card, dog leash, and some treats. The storage space could be greater, but even with the back pocket feature, this dog carrier allows you to bring the essentials with you. 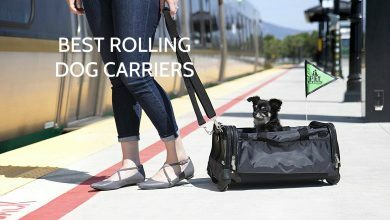 As the cherry on top, this carrier is airline-approved and can fit airline seats, so you can really take your dog everywhere with you. All in all, we’re confident that this is the best dog purse carrier on the market for people who just need a reliable, great-looking dog purse with some basic storage space. At 2.7 pounds, this pet purse carrier for small dogs definitely leans on the heavier side. But what it may be ‘lacking’ in weight, it makes up for in stylishness. 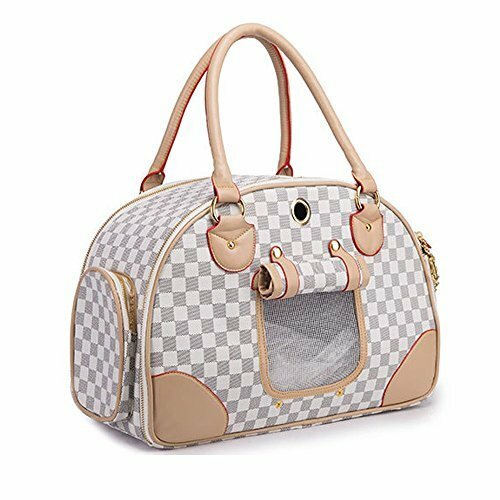 The soft beige (or brown, depending on your color choice), checked design with red details is reminiscent of haute couture brands, and the synthetic leather it’s made of is very durable, although not waterproof as with the PetsHome purse. 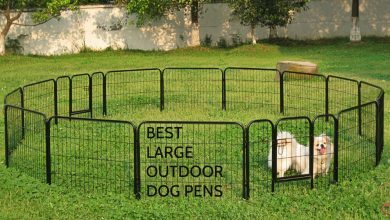 It comes in two sizes: small (13.7 x 10.6 x 7.87 in) and large (15.74 x 11.81 x 7.87 in), although both fit small only small dogs. It can fit well beneath an airplane seat, so this would be a good option to consider if you’re traveling a lot. This cute dog purse comes with a detachable, adjustable shoulder strap and features a velcro bottom plate that’s easy to remover and even easier to clean. 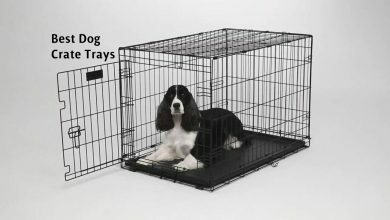 There are two mesh panels on the narrow sides of the tote, which should be enough to provide ventilation for your pup, in most circumstances. However, if it’s a really hot day and you’re going on a really hot walk or spot, keep in mind that the lack of airflow can become an issue. There is another zipper mesh on top, beneath the top closure of the tote, but as there is no way to secure the closure from not falling over the tote, it could be hard to reap the benefits of the mesh top. The only access to your dog is from the top, which could be scary for them, especially if we’re talking about a pup, but that’s nothing a few days and a lot of treats when inside can’t handle. There are a front button pocket and a back zip-pocket which are enough to carry a small wallet, leash, and treats. However, the pockets aren’t deep or wide enough to fit an iPhone 6 Plus, for example, so if you’d like to carry your phone in the purse, consider getting a mini-purse to keep inside, next to your dog. 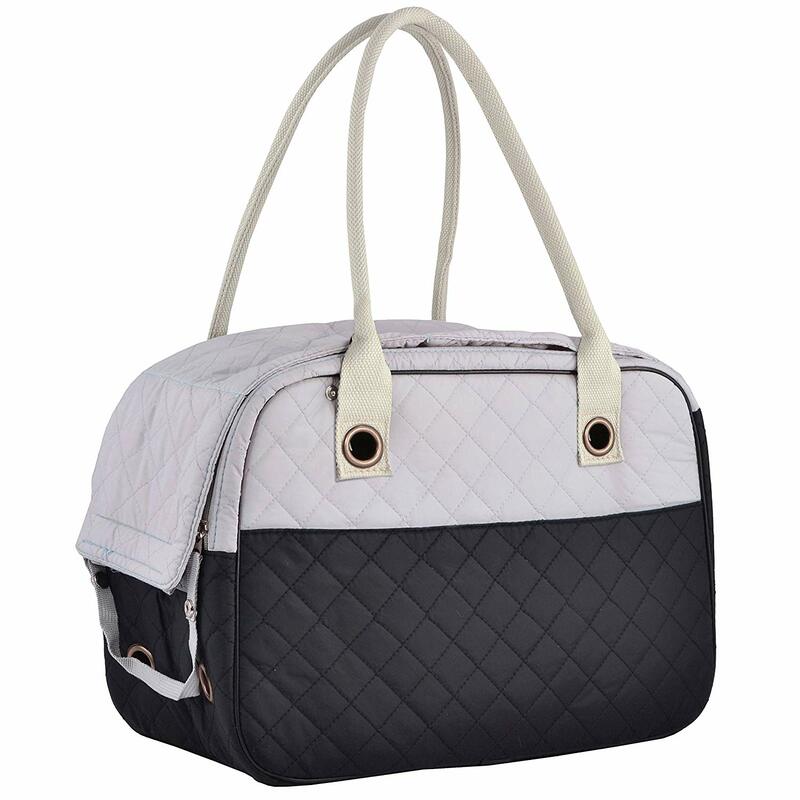 The most fashion-forward choice of our top 3 dog carrier purses, the Kenox bag is the epitome of chic. At 11.9 x 12 x 16.5 inches and only 2 pounds, this is a very light and well-proportioned small pet carrier purse. Be aware, thou, that because of its narrower shape, long dogs will have some trouble turning around and moving inside of this tote. However, this is far from a deal-breaker, just a friendly reminder if you have an energetic and restless pup. The outside of this tote is striped with metallic accents, while the inside has a leopard print – a combination that works remarkably well together, despite the clash of the prints. This isn’t the type of bag to go unnoticed, so if your style is more on the chill side, you might want to skip this one. This small dog purse tote features an inner leash clip, a side opening, and a mesh and an opaque top cover (similar to the Betop tote). The opaque cover can be fixed in place so that you can make full use of the mesh zip cover. Speaking of mesh, the ventilation on this dog tote is quite satisfactory, provided that the top opaque cover is removed. If not, you’re down to just one side mesh panel, which isn’t enough to provide good airflow. The bottom of the Kenox tote is pretty hard, so be prepared to either purchase a pillow that is adequately sized or to improvise with a towel of a blanket. However, keep in mind that putting an extra fluffy bottom will make the inner dimensions of this tote smaller, which could be an issue if you have a taller dog. Where this dog bag purse really makes amends for the hard bottom and the breathability, is with storage space. Out of the top 3 dog totes, this one has the most storage space, bringing it closer to a purse that is also a dog carrier, rather than a pet carrier that looks like a purse, if that makes sense. There are two vertical magnetic snap pockets and a horizontal zip pocket on the front of the purse, which is reasonably spacious for all essentials you might want to carry with you. Given the position of the pockets that are a bit bulgy, as well as the one-sided mesh cover, this tote is essentially fit for wearing only on one shoulder, if you don’t want your pup to look backward and the pockets to be pressed against your body. As a stark contrast to the visual liveliness of the Kenox tote, the MG pet purse is far more simplistic and subdued. This dual-toned, 16 x 7.5 x 11.75in sporty bag comes in three color combinations: black, purple and turquoise, and the top of the bag remains light grey in all combinations. The only mesh material is located on the top of the bag, and it’s a mesh zip flap that is beneath the quilted fabric flap, which can be rolled over so as to provide constant airflow and plenty of ventilation. There are also 8 discreet grommet-reinforced ventilation holes in the lower parts of the tote. The handles are sturdy but soft, and the bottom of this small dog carrier purse features 4 hard studs so that it doesn’t get dirty when placed on the floor. The inner bottom panel is removable and easy to clean. As far as the storage goes, there are two large Velcro pockets on both sides of the carrier, so you can take your phone, wallet, leash and treats with you. On the downside, there is no viewing mesh panel, other than the top flap mesh, which means that if you close the purse, your pup won’t be able to see anything and will be in (almost) total darkness; this could be a problem, especially for curious dogs that really like to explore, even from their carrier. Also, this bag isn’t very successful in trying to be stylish, and it doesn’t look like a typical purse, so if you need a stylish option, we’d advise on going for another one. This dog purse for small dogs is more practical than anything else. The WOpet small dog purse is made for pups that weigh 10lbs or less and is made out of soft, high-quality PU leather that’s easy to wash. It features a ventilation hole on the front, a zipped top opening that goes all the way to the ground and the bag has two smaller mesh panels on the front and on the side. The front one has a privacy roll-up flap cover. Since it’s made for really small dogs, the two mesh covers will provide sufficient ventilation. Unlike the previous purses we’ve discussed, this one doesn’t have a mesh flap top, so it would be easier for your dog to escape it if it got scared, restless or just excited. On the flip side, there is an inner leash clip which is sturdy enough to prevent your dog from running away in case the top was opened. The storage compartment consists of one zip side pocket, which is enough for your regular bare necessities, but nothing more. The main selling point of this tote is its stylish looks – it’s bound to provoke a lot of compliments, and chances are no one will even know you’re carrying a dog around in it, except if you let it sit in it and put his head out. Good news for those who were thrilled with the Kenox dog purse design, but not so much with the dimensions: the Shinysnail has practically the same striped print with metallic detail on the outside and a leopard print on the inside, but its dimensions are 4.7 x 13.4 x 15in and are suitable for airplane travel. Other than the siting, the mesh panels, storage units, and the opening remain the same as the Kenox pet carrier purse. Another difference comes regarding the bottom: the Shinysnail purse features a removable safe mat that is safe to wash in a washing machine and that makes the bottom panel much softer. One of the drawbacks of this particular puppy purse is that it’s not very firm, according to one customer, and can squish your dog a little if you wear the purse on your shoulder. Also, if you have a taller dog, the inner leash clip might be positioned too low on the inside of the bag, which means that the pupper may not be able to comfortably sit in it. Other than that, this is a really cute and practical dog tote carrier. This creamy, sturdy dog carrier purse comes in two sizes: small (13.7x7x10in) which is ideal for dogs that weigh up to 8-9 pounds, and medium (15.7x7x11in) for dogs that weigh up to 13 pounds. Even though it features 6 ventilation holes, the ventilation on this one is lackluster – if you don’t constantly keep the top open and expose the top mesh flap, that is. It’s made out of durable, high-quality Oxford cloth that’s easy to clean, it has a lot of storage space – 4 pockets in the front and back, and it comes with an adjustable shoulder strap as well. Inside, you have a removable padded bottom panel and an inner leash clip for added safety. 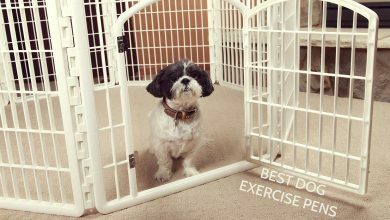 Although it looks stiffer than it actually is, it is sturdy enough to keep its shape and support the weight of your dog, especially because of added bottom panel support and 4 studs on the bottom. If you’re not the biggest fan of the label, that’s totally understandable; the good news is that it can easily be removed. The Jespet is a sporty-looking pet purse for small dogs that weigh up to 13 pounds. It measures 17x9x11in and is airline-approved! This tote dog bag features a zip opening, ventilation holes, an inner leash clip, a removable mat and 4 side pockets, so there’s a lot of storage space, whether you’re talking a long walk or an airplane trip. However, if you’re not planning on letting your dog poke ou their head through the zipper opening, there definitely won’t be enough airflow in this carrier and your dog might end up overheating. 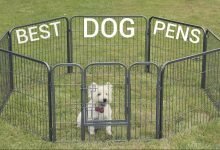 This wouldn’t be a problem if your dog is laid backs and enjoys walks in the carrier, but is relevant if you have a dog with a more reserved character. Visually speaking, this tote is simplistic and cheerful and is cream, blue and black-colored. It’s made of durable 600 Denier Oxford material that is water-resistant and easy to clean. At 1.5 pounds, this is the lightest pet tote carrier purse out of all that we’ve reviewed so far, which is great – the less the tote weighs, the longer you can carry it without getting tired. This purse-style dog carrier has come straight out of a minimalist’s dream. It’s all black, with a very simple shape, and the only decoration it has is a discreet black bow tie in the front. It’s made out of PU leather and out of all dog totes we discussed here, this one looks most like a regular women’s purse. It measures 7.8x13x16in and can carry dogs up to 14 lbs. The tote is well-ventilated, with a large mesh panel and a top opening, and features a top and side zip entrance. 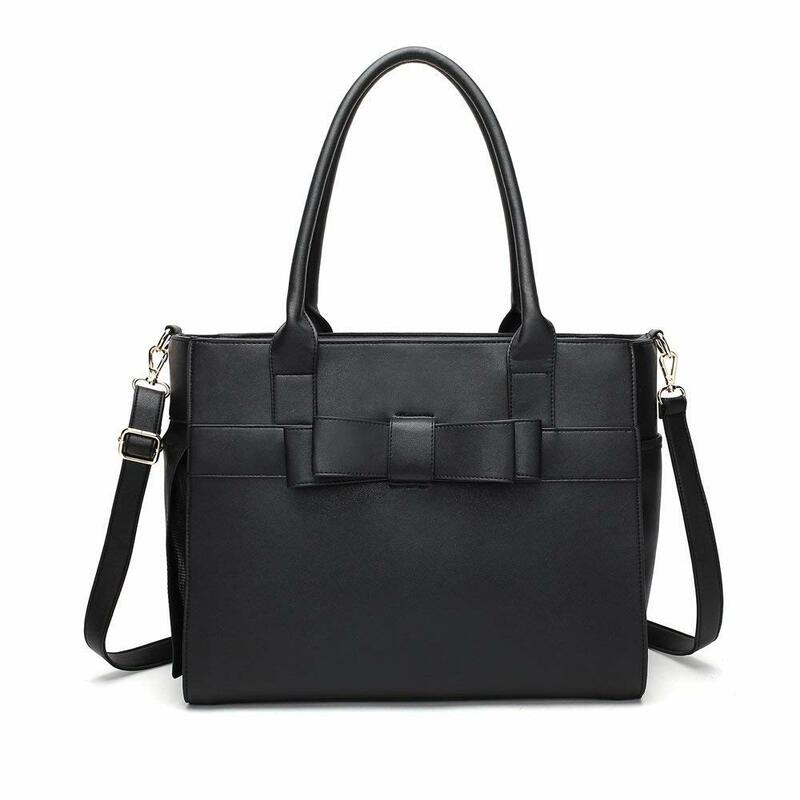 This elegant purse comes with a side zip pocket and an open slip pocket, although that storage space is far from substantial. 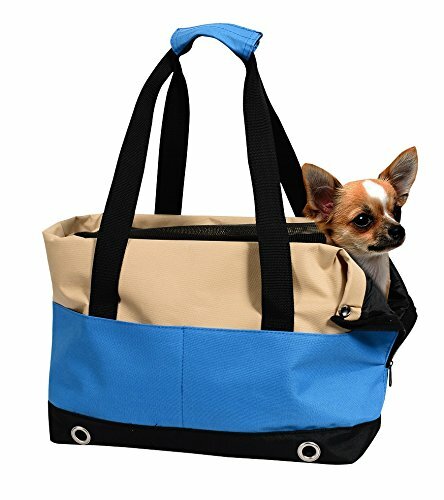 Comfort-wise, the bottom of the tote is padded and the inside is spacious for a small dog. One of the greatest downfalls is that this WOpet piece weighs 3.59lbs, which is significantly more than any other tote on this list. However, if you value style over ease, and are searching for a tote that will hide your pet, then this elegant bag is a no-brainer. 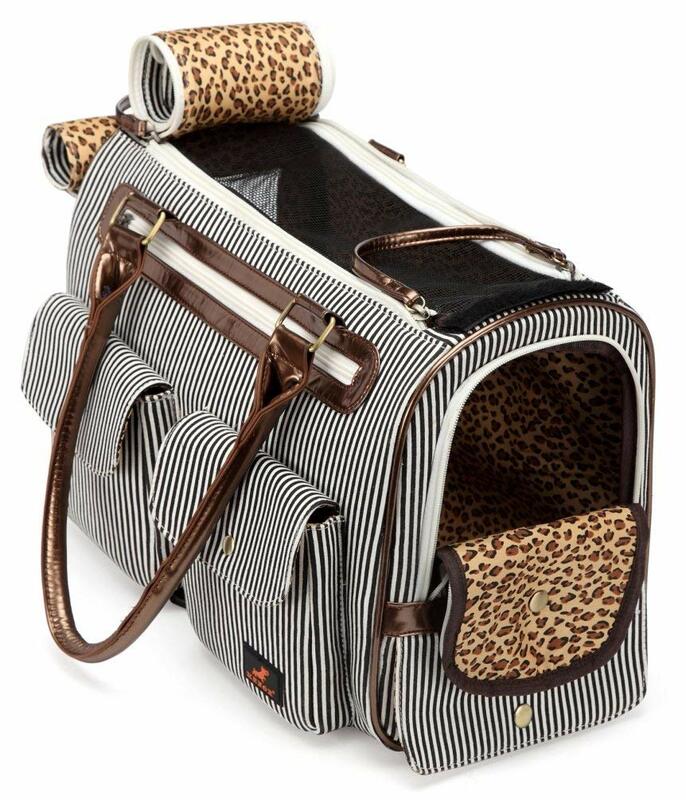 The Anima pet carrier is another great lightweight option (it weighs only 1.5 pounds), although seeing how it’s made for dogs that weigh up to 3lbs, it’s not that lightweight in comparison to other totes. This 13.5 x 6.5 x 10.5 in puppy purse carrier is ideal for Chihuahuas and similarly-sized dogs. 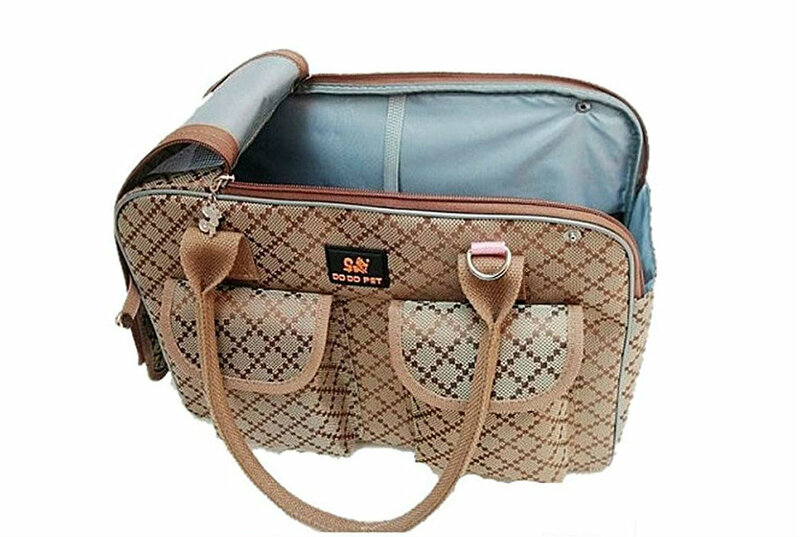 It features a classic houndstooth print and is really well-designed; a passing observer should focus very hard on it to notice that it is, in fact, a dog carrier. The mesh ends provide sufficient airflow, and the ever-useful inner leach clip is featured on this tote model as well. Both the top and the sides of the purse can be velcroed open to allow the dog to poke their head out, look around and enjoy the ride. As some of the downsides, a couple of users pointed out the lack of a roll-down protection cover on the mesh panel, as well as a medium-quality build. However, at the price point, most customers were more than happy with this dog purse. For all intents and purposes, dog carrier purses are made for small dog breeds. It would be too hard for anyone to carry around a pet heavier than 15 pounds, no matter how much we loved them. Dog carrier purses are a great solution to talking long walks and visiting spaces that are otherwise off-limits for your furry friend. With a reliable and sturdy dog tote, you can go places together, be it a bus, your workplace, a friend’s house, a park, pub, party, movie theater or a long car ride during which you need your pup to be still and safe in one place. No matter where you go with your dog, they will always have their safe place to feel comfortable in, especially if you’re making new experiences and visit a crowded bar, for example. Dogs cherish having their safe place, and getting a dog purse carrier will be a fantastic gift to your dog, as well as to yourself. You’ll look back to your tote-less days and wonder how didn’t you think of this sooner? Don’t worry, no one’s perfect, and we all need time to realize the magic of having a beautiful dog purse. By their very nature, dog carrier purses are multifunctional. They blend together a purse with a dog carrier, allowing you to wear only one bag with you, instead of two. If you have a medium-sized dog, you might want to consider getting a dog carrier with wheels instead of a purse carrier – it’s way more practical than carrying around a 20-pound dog. Purse dog carriers vary in design, style, and features, but they are all similarly constructed. They consist of the tote itself, which can be shorter or taller but is almost always rectangular shaped so that the dog can lie down in it or sit straight. They all have two handles, and some come with a shoulder strap as well. And of course, all of them come with some storage space – some have the bare minimum, while others are more generous with the pockets. When choosing a dog purse, the first thing you should do is to consider its character, what they enjoy and how playful they are; are they restless and energetic or laid back and calm? 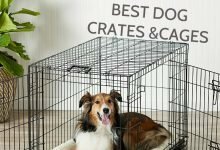 These are all important factors when choosing a dog tote, especially when deciding on the level of privacy your dog will have in it, as well as the size and type of the opening. Without further ado, let’s take a look at some other important things you should consider when buying a dog carrier purse. When shopping for a dog purse, your primary goal is to find the one that suits your style, because no one will wear something they don’t like, long-term. When you find all the ones you like, you should take into account your needs and the needs of your dog and ultimately get the one you think your dog will be most happy to be in. In the end, it’s just as important that the dog likes it as it’s important that you do. Let’s get one thing straight: a lot of dog purses will be labeled as small, medium or large. While they may differ in their measurements, you should know that there is no such thing as a large dog purse carrier. Large, in the context of dog totes, means a slightly bigger version of the small one, and that’s it. There are some dog purses that look and feel bigger than the others, which is mostly thanks to materials used and whether the pockets are bulgy or not, but all of them are best suitable for tiny-to-small dog breeds. 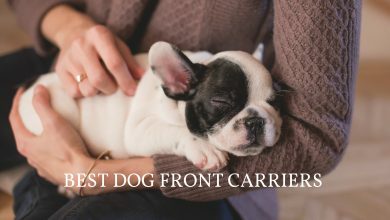 So, in order to get the right dog carrier for you, measure your dog, primarily in inches, and then measure their weight as well – some carrier purses have a weight capacity specifically limited, while others just assume they’ll be able to carry any dog (or some other pet) that fits the small height, width and length measurements. Nobody knows your dog as well as you do. It’s up to you to make a decision whether they need some added privacy on their purse, or if they are comfortable with being looked at, talked at, petted, and ‘unshielded’ from the rest of the world. The best way to assess this is to see how your dog behaves with strangers and new dogs in the park. Does your dog freely approach others, or are they reserved and easily scared? The answer to these questions will help you decide whether you want to get a tote that has a roll-up privacy flap over the mesh panels (which are necessary) or not. If your dog likes to meet new friends and explore their surroundings, they might really enjoy a tote that has a top opening instead of the ide one, because that way they can sit in it while you carry them and look at the world around them. Also, if you decide on getting an open-top dog carrier purse, make sure that it has an inner leash clip so that you’re sure that no matter what happens, your dog won’t jump out f the bag and get hurt. The average price of a dog carrier purse is around $50. This is the kind of product that really doesn’t have significant oscillations in price: it can go around $25 lower or around $25 higher, but it can’t get to a point where you need to get a triple-digit dog purse in order to get a high-quality one. Think of it as buying a purse for yourself – most purses would be priced very similarly; this way, you’re getting two products in one, so either way, you win. However, if you don’t want to spend your hard-earned money on the best dog purse you can find, and you’re satisfied with just having a regular dog purse for some quick visits to the vet or rare outings when you might need it, there are some really good, sensible options for just under $30. Because dog carrier purses are made for small dogs, to begin with, you’re more likely to find a durable one than you are with some large breed products. The important thing to keep in mind is that the tote material should be sturdy. What we mean by this is that it shouldn’t only be durable, but firm as well. You’re going to carry this tote around on your shoulder, and a part of your arm will naturally rest on the outer side of the carrier. When this happens, it’s important that your dog doesn’t get squished but that the carrier keeps its original shape. The crucial thing to keep in mind is the mesh materials. Remember: one is never enough! You need at least two mesh panels or openings – ideally positioned opposite one another – to ensure air circulation as you move. This isn’t only a matter of comfort for your pet, but a healthy matter. The last thing you want is for your dog to lack oxygen or become overheated. The heavier the dog is, the more oxygen they need. Also, consider the fact that they will more likely spend hours than minutes in the carrier tote, so choose your bag wisely. Aside from doubling as a dog carrier and a purse, these hybrid products can be used as portable dog beds. This is likely to happen if your dog is crazy about the tote and connects it with having a blast with their owner. Also, there are some dog carrier purses that are airline-approved, so that you don’t have to buy another one just for the sake of airline travel. In fact, precisely because they’re so small, dog carrier purses are most like to fit some, if not all airline luggage measurement guidelines. Dog purse carriers can’t be used as purses if they don’t have some pockets, right? Because in that case, they would only be dog carriers and not purses. So, every dog carrier purse has some storage, it only depends on how much it has. Most of the time, there will be enough space for you to pack your keys, credit card, dog leash, and dog treats. Some more generously proportioned storage units can fit smaller wallets and mobile phones, although this is rarer than the first case. Often time you’ll either have to deal with carrying your wallet and mobile phone in your pocket instead of the dog carrier purse, or you can buy a dedicated phone purse and solve all your problems! Expert tip: Try giving your dog treats whenever they’re in the purse, especially in the beginning when they’re only getting to know the new item. This way, you’ll create a feeling of the carrier purse being a safe place in which good things happen. Who wouldn’t want to spend hours in a place like that? Some cheaper pet carrier purses might lack just one detail in order to be great. For instance, a lot of cheaper options lack a padded bottom or a foam bottom – something that will keep your dog soft and comfortable, essentially. Consider buying a cheap sleep mat for your pet before you decide on giving more money for the ‘better’ carrier. Dog carrier purses are wonderful things – they can only change your life for the better. Not only will you get to spend more time with your pet, but you will build a stronger bond between the two of you, and develop a deep sense of trust as well. It’s not an easy thing to allow someone to carry you around and not knowing where you’re going. Dog carriers require a lot of trust and friendship. That’s why you’ll enjoy them so much – they will be a sort of proof of a bond that you and your dog have. On a more practical note, if you ever wish to upgrade your dog purse carrier, and your model came with an adjustable shoulder strap, don’t hesitate to attach any purse shoulder strap you have; they will probably be sturdier and more stylish – you can even buy a few and then switch them up, according to your #ootd. Dog carrier purses are truly great – if you find one that works for the both of you, your dog will be pumped to get inside and go for a walk, especially if they’re not that fond of walking. The purse will easily become one of their favorite activities and a portable safe place. In this article, we’ve helped you pick out the best dog purse carrier for you and hopefully, after reading our buying guide, you now know what you need and what should you look for.